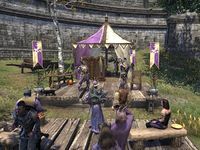 The Jester's Festival is a tent found east of Daggerfall, just outside the city walls. It is only marked during the Jester's Festival event. During the event, several NPCs can be found here.